In honor of St. Joseph's Day, Ms. Artale's Italian class put together the "Tavola di San Giuseppe". Father Frank gave his blessing over the table offering to Saint Joseph. 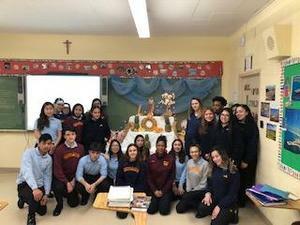 Students have been learning and reciting the rosary in Italian.